+$Getting yourself a power bank can save you from that on-going fear at the back of your mind of dying laptops and phones with low charge. If you've been considering getting your hands on a new portable charger, then you're in the right place. 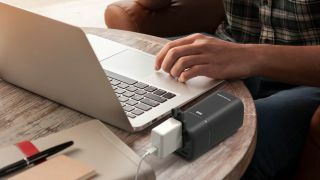 We've tracked down all of the best power banks on the market to save you from low battery scares and power outage embarrassments. +$The great news here is that getting yourself high-end portable chargers doesn't have to drain your bank account. There are a number of great, affordable options on the market to keep your devices topped up. Scroll down to discover the best power banks available at the moment. +$Finding the best power bank for you will depend on a few factors. Firstly, if you find yourself away from a power point for long periods of time, constantly working on different devices then you'll be wanting a high battery capacity. This is measured in milliamp hours (mAh). If you're likely to want to charge more devices, then checking how many charging points the portable charger has will be key. +$If your work already requires you to carry lots of heavy gear, you'll be wanting a more lightweight portable charger. A balance has to be struck between power and weight, usually as the power goes up, so does the weight. And if you do find the best power bank for you, you'll need to first check whether it is actually compatible with your specific devices. +$We've set out all these stats to make it easy for you. And beyond that, we’ve categorised each of the best power banks on this list according to their particular USP: for example, best budget power bank, best power bank for Apple devices, and so on. So read on to discover how you need never be out of power again, and all for a relatively small outlay.